Tested and endorsed by the Federation of British Historic Vehicle Clubs. The unique phosphorous based formulation provides the best possible protection against damaging metal to metal contact between the valves and the soft valve seats - the job previously done by lead. Without such protection your engine may experience valve burning, loss of compression and engine failure. Valvemaster is the recommended solution for cars and motorcycles requiring valve seat protection and 95ron octane unleaded fuel. 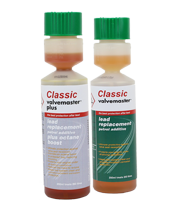 Valvemaster Plus is the recommended solution for cars and motorcycles requiring valve seat protection plus an Octane Boost of up to an additional 2 octane when added to either 95ron, 97ron or 99ron octane unleaded fuel.